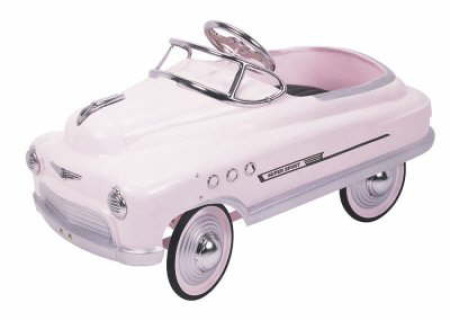 Comet Pretty pink Pedal Car has been specially designed for little girls. The car features a black padded seat for comfort, chrome hood, chrome windshield, chrome headlights, chrome grill ornaments, chrome steering wheel, chrome portholes and hubcaps. Body made from heavy gauge steel, no plastics used. Built just like the Murray Comet cars were made in the 50's, this car is guaranteed to keep your child amused for hours and is sure to become a family heirloom.